Tens of thousands of Russians took part Saturday in rallies across the country organised by Communists to protest against government's anti-people plan to hike the pension age. 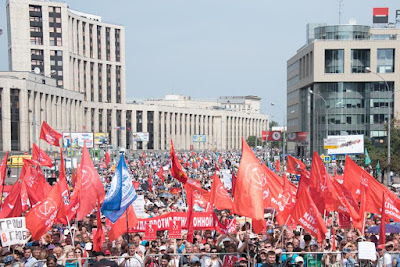 In Moscow, organisers said up to 100,000 people gathered for a permitted rally against the government-backed reform, which is currently going through parliament. However, reporters put the turnout much lower at around 10,000. Protests took place in dozens of cities and towns in far eastern Russia, Siberia and western Russia. Around 1,200 people protested in the Siberian city of Novosibirsk, TASS state news agency reported, citing city hall. Demonstrators in Moscow chanted "Pension-off Putin!" and carried banners with slogans including "We want to live on our pensions and not die at work." In Russia’s second largest city of Saint Petersburg, around 1,000 people took part in a Communist rally, with some waving red flags and holding portraits of Stalin. The rare show of public opposition to a reform backed by President Vladimir Putin’s ruling party has seen 2.9 million sign a protest petition and the often compliant Communist Party vote against it. Putin, who did not mention the issue ahead of his re-election in March and had previously vowed not to raise the pension age, has seen public trust in his presidency fall to 64 percent this month, down from 80 percent in May, according to VTsIOM state pollster. "Many believed Putin when he said there would be no pension reform. It turns out that was demagoguery. I’m very disappointed in him," protester Irina Ivanova, 49, told AFP in Saint Petersburg. 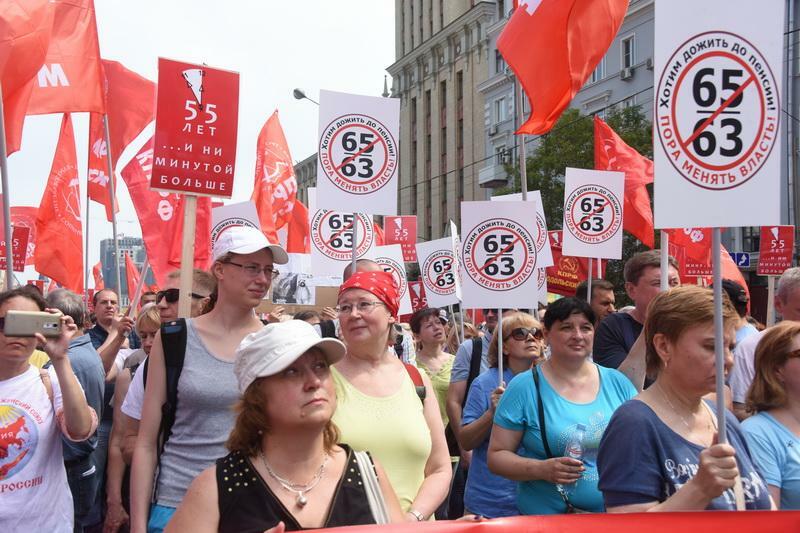 The draft law calls for the pension age to be gradually raised to 63 for women and 65 for men, up from the current Soviet-era norms of 55 for women and 60 for men. Putin last week said he disliked the idea of raising the pension age but that doing nothing was not an option, insisting "we will have to take some crucial decisions". "Tens of thousands have gathered here to say no to this pension reform," Communist Party leader Gennady Zyuganov told the Moscow rally. "This is a blow to every citizen in our country." Those who oppose the reform argue that many Russians, particularly men, will not live to enjoy their pensions. Currently, Russian men on average die in their early 60s, Zyuganov said, and "they will all get their pension in their coffins". In addition, many Russians say that employers are reluctant to hire older people. "How will we live? I don’t know. They don’t hire anyone over 50," said 59-year-old Galina Nikiforova in Saint Petersburg.